Who ever heard of a snozzberry? Really. I had a Peanuts lunchbox. Sorry for being off-center. I was being buzzed by a drunk hummingbird at the time. 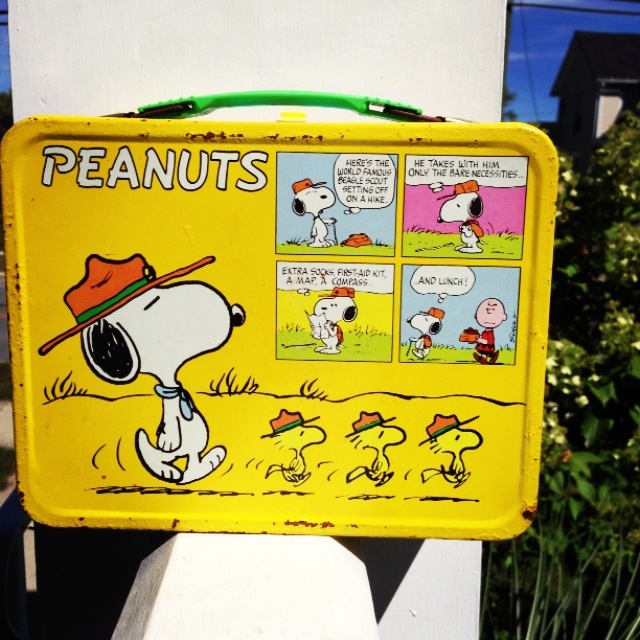 Here is a picture of my beloved Peanuts lunchbox. I’ve had it since I was in the 3rd grade. This thing is metal, baby! Part food carrier, part body armor. It’s carried hundreds of peanut butter sandwiches, countless carrot sticks, dozens of those little boxes of raisins (that you had to completely tear apart in order to get the last of the raisins that stubbornly stuck to the bottom), and gallons of 2% white milk (some of which I actually drank). While other kids smugly unpacked their bologna sandwiches from their machismo-inspired Dukes of Hazzard and Knight Rider lunch boxes, I secretly knew that my lunchbox was of far superior quality. So what if I read the 6 comic strips printed on the box about 10,000 times?! My box promoted art and literature which would surely pay me rich dividends of a more cultured lifestyle in the future. Still waiting on that, by the way. Now, I’m not preaching the virtues nor decrying the evils of merchandising. But there’s something powerful about Watterson’s resoluteness in keeping his art the main thing. Because, when it comes to any endeavor, goal, or vocation, it’s easy to lose track of what got you started in the first place. And when you lose that sense of purpose and passion, the momentum and clear sense of calling goes out the door. So I’m asking myself, Why did I get into this whole pastoring thing in the first place? Because that sense of calling and purpose can get quickly lost and replaced by distractions and worries. For pastors this often comes in the form of attendance worries, financial concerns, professional future, interior and exterior sources of unrealistic expectations. At a recent gathering which included some dear friends from seminary, the question was often put to me, “So, how do you like your sabbatical? How’s it going?” And I have to be honest: there is something really scary for me about not going to the church office every day and the sanctuary every Sunday. If I’m not there, will the things get done?! I must do all the things! And then I remember that it wasn’t about the things that initially drew me to church ministry. It was community, a group of misfits and outliers getting together and trying to make sense of what it means to follow Jesus in a beautiful but flawed world. I got into it to communicate what I believe to be the central message of the Bible: God welcomes broken people into the life of God to make something wonderful in the world. At this halfway point in my sabbatical, I’m far enough away from the day-to-day of ministry to see this a little more clearly, and close enough to it again to anticipate returning. And this, too, is a gift from God. So, this is my primary purpose, my main thing. What’s yours?